AMG was founded as a racing engine forge in 1967 under the name AMG Motorenbau und Entwicklungsgesellschaft mbH (AMG Engine Production and Development, Ltd.), by former Mercedes engineers Hans Werner Aufrecht and Erhard Melcher. The letters "AMG" stand for Aufrecht, Melcher and Großaspach, Aufrechts birthplace. On 1 January 1999 DaimlerChrysler, as it was called between 1998 and 2007, acquired 51 percent of AMG shares, and AMG was renamed to Mercedes-AMG GmbH. On 1 January 2005 Aufrecht sold his remaining shares to DaimlerChrysler, and since then it has been a wholly owned subsidiary. AMG specializes in Mercedes high performance cars. AMG models typically have more aggressive looks, higher performances, better handling and better stability, and more extensive use of carbon fiber than their regular Mercedes counterparts. AMG models are typically the most expensive and highest-performance of each series, with the exception of non-AMG V12 models found in the most expensive nameplates of the Mercedes lineup. 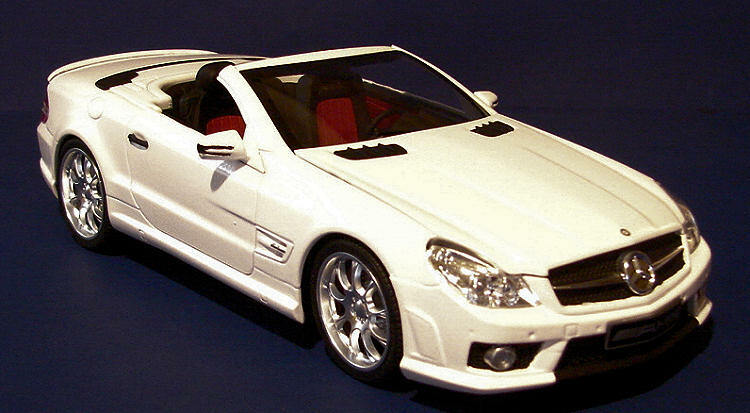 The Mercedes SL class got a facelift for 2009 — most noticeable are the sinister new headlights — but still uses the basic platform that made its debut for the 2003 model year. 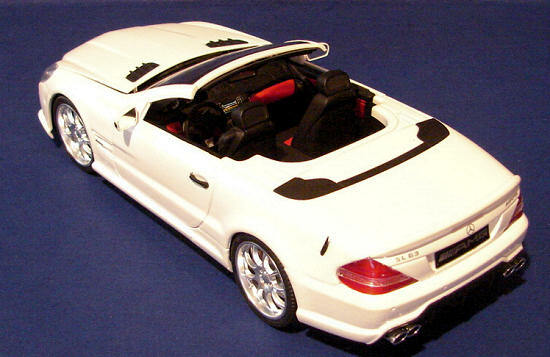 Which means that the SL63 AMG looks much like an SL55 AMG. The SL63’s new 518-horsepower V-8 is hand-built and flings the car to 60 miles an hour in 4.4 seconds. The SL63’s transmission incorporates new features that further muddle the distinctions between manual transmissions, sequential manuals and automatics. The 7-speed gearbox, an AMG Speedshift MCT, is an automatic that dispenses with the usual torque converter, instead using a wet clutch to link the engine to the drive train. At 4,274 pounds, the SL63 is about 200 pounds heavier than the GLK350 4Matic crossover wagon. It sells for a whopping $138,475! Molded in several colors, the kit shows a nice level of detail and is beautifully done. A set of aluminum plated wheels is included. Taillights are provided in red plastic. A set of springs is included that I really don't understand as the suspension is not moveable. Decals are provided for the dash, instruments and engine as well as various decals for the car itself. Masks are provided for painting the clear parts, but the instructions never mention them. Instructions are well done, providing 26 very clear assembly steps. The steps are all pictures, but provide paint callouts and option notes as needed. The kit is what I call a "semi curbside", as it provides most of the engine but in very simplified form. I deviated from the instructions in that, to ease painting, I assembled the whole body first. You will have to leave off part #67 in step 18, but it can't be seen in the end anyway. The headlights and taillights can be added afterwards, but you have to be careful with them. The fit of the taillights is poor, so do some test fitting before attaching the rear bumper. The fit of the hardtop is quite bad, with a rather large gap at the front. To get it to fit the windshield header properly will take a bit of work. As I was building the convertible, it really didn't matter to me but others should be aware of it. For the rest of the build I more or less followed the instructions. The engine is just a simple block with the intake manifold molded in. The fit of the engine into the chassis is a bit tight, just make sure you get the drive shaft inserted in its hole before attaching the engine to its mount. Next up is the suspension. Aoshima provides real springs for the shocks, but I can't understand why they did this. Once everything is installed, the rear suspension moves very little and the front not at all. Take care of the rear suspension during the rest of the build. 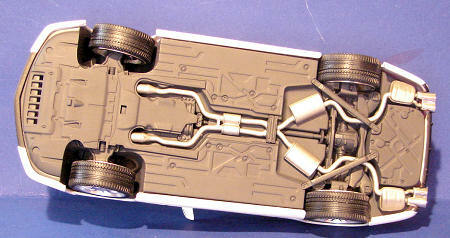 The tops of the struts protrude from the tops of the wheel wells and it is possible to pop the rear cross member loose. Fitting the tires is a bit nerve racking, as they are a very tight fit. Aoshima does it different then any other kits I have built in the past. They use the normal poly caps, but there is nothing to hold them in the wheels, they are just a press fit. Getting them onto the stub axles is a exercise in caution, it would be very easy to muck up the whole works here. The fit of the 3-piece dash is poor and I had to trim it a bit in order to get it to fit together properly. The rest of the interior went together nicely. The front bumper in my kit was warped, making installation a bit of a problem. I ended up gluing one side, letting it dry, then gluing the other side. I also wish Aoshima had made the front grill a separate part. It would have made painting a whole lot easier! It's important to get the bumpers attached correctly in order for the lights to fit. The rear bumper needed to be trimmed to get a good fit. After painting, I installed the lights. If you choose to do it this way, carefully snap the clear parts in place and then the chrome parts. It is a very tight fit, but this way, fixing seams is not a problem. I find it odd that Aoshima provided the taillights in red plastic, but the third brake light is clear. After the chassis and body were done, they were fitted together. Getting the body to fit the mountings on the chassis is difficult as you can barely see the front ones. The last bits installed were the convertible cover, door handles, wipers, radio antenna and windshield. I had to remove the hood hinges as they would not clear the windshield. That may have been my fault, I'm not sure. The instructions recommend silver for the car, but I chose to paint mine white. I think it just looks good in white. After the body as all assembled (front and rear bumpers, rear spoiler and side pods), it was primed with MM gray. I then shot a couple costs of MM Bright White. All the trim was painted flat black as per the instructions. The chassis was assembled and then painted Floquil Grimy Black as a whole. The exhaust was painted MM Steel. The interior was painted flat black with red trim. I wanted something a bit more "showy" than just black and I found a photo on the 'net of a car with a black/red interior. I thought it looked cool. 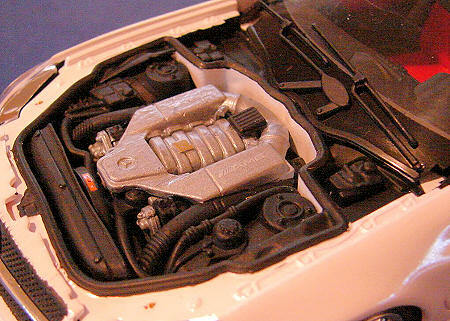 A lot of the engine can be left unpainted if desired. Most of it can't be seen when the model is completed. This includes the lower block and transmission. I did paint mine aluminum, but it was a waste of paint. The cam covers were painted black as were the drive belts. Again, most of this can't be seen. Pay close attention to the instructions when building the kit, as there are decals that need to be installed as you go. These include decals for the engine and the decals for the interior. You have the option of license plates or AMG logos for the front and rear bumpers. All the decals fit with no problems (even the panel gauges!) and responded well to MicroSet. Nicely detailed, but simple to assemble, I recommend this to experienced builders as well as those just wanting to give a car a try. Editor's Note: White is a very difficult color to photograph well as it tends to wash out. This is particularly true with digital cameras. I have darkened some of the overall images to bring out the detail on the body. The red you see in a couple of images is not that dark.